Image: Jake & Dinos Chapman (born 1966 & 1962), The Disasters of War, etching, 1999. From the set bought with the help of the Art Fund and the V&A/MLA Purchase Grant Fund, 2010. 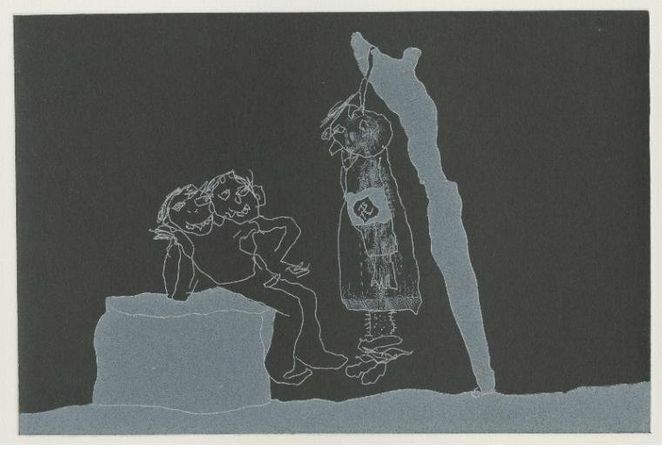 The series of 83 etchings The Disasters of War(1999) by Jake and Dinos Chapman adapts and subverts Goya’s series of the same title, but also comments on the cruelties and fatal consequences of later wars. This exhibition shows how the artists manipulated the imagery and impact by printing a second version in white ink on black paper, and a third version on pages from a child’s colouring book, with chilling and sometimes comic effect. This is particularly striking when viewed against a selection of prints from Goya's original series, revealing the full consequences of the Chapman Brothers’ invention and intervention. Fatal Consequences is designed to complement the concurrent Silent Partners exhibition, which also includes the Chapman Brothers’ work. It is part of a sequence of exhibitions on the theme of war marking the centenary of the First World War, and in this case also marking the 200th anniversary of the Spanish Peninsular War, which was the subject of Goya’s series.